After analyzing Dr. Kershman’s precise treatment instructions, Invisalign translates these instructions in a sequence of finely calibrated aligners. 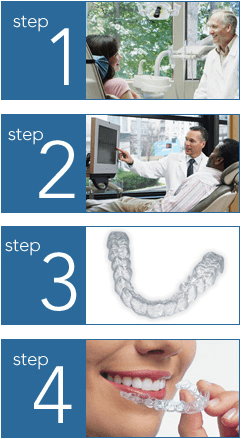 The number of aligners corresponds to the complexity of your treatment. Each aligner is normally worn for two weeks and is only taken out to eat, brush and floss. As you replace each aligner with the next, you will see your teeth gradually move to the desired position — week-by-week until Dr Kershman’s prescribed alignment is attained. Dr. Kershman is also trained in the use of Acceledent and Propel to help you achieve that smile you’ve always wanted even faster…In 1/2 to 2/3’s the usual time!! !The more precise the data being used to prepare your treatment, the better the results will be. That’s why Dr. Kershman uses the iTero state of the art digital scanner to prepare your data for Invisalign. Dr Kershman, an Orthodontic Specialist, has been trained and certified by Align Technology to diagnose and treat your bite using Invisalign. Not all cases can be treated solely with Invisalign. Those who have a more complex treatment (less than 5% of cases) can be treated with a combination of Invisalign and a short period of partial fixed braces. Only a highly qualified orthodontist like Dr Kershman can determine which Treatment (Invisalign , Acceledent, Propel) is the most beneficial option for you.Dr Kershman’s Treatment can help you achieve the smile you’ve always wanted. Contact us to make an appointment.